Fort Rock Cave, is a very significant site in the annuals of North American Archaeology. Nearly 80 years ago the cave and its deeply buried secrets altered the prevailing ideas about ancient American in the great Basin. For many years it was one of the oldest dated sites in North America. The site is located in the Fort Rock Valley, an arid landscape named for a volcanic monument about 50 miles southeast of Bend, Oregon. In 1998 Gordon and Henrietta Wanek of La Pine, Oregon, donated a 20-acre parcel that included the cave to the Conservancy. Now the Cave has been transferred to the Orgeon State park system for ongoing protection and public access. Today visitors can schedule special tours during summer months of the site with the State Park service by visiting Oregon State Parks. Luther Cressman, Professor at the University of Oregon and today considered the Father of Oregon archaeology, first entered the Fort Rock cave in 1938. After digging through Fort Rock Cave’s surface layer of cow manure, he found a layer of volcanic ash that later research confirmed was the result of Mount Mazama’s eruption 6,900 years ago—the event that created Crater Lake. 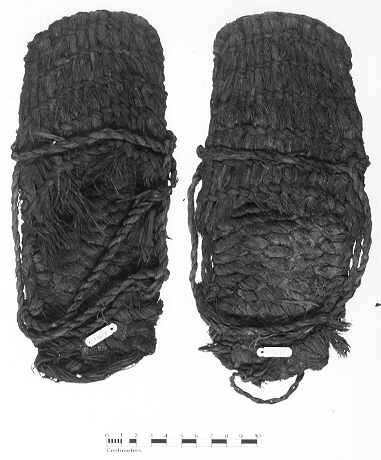 Below this layer he uncovered numerous artifacts, including 70 pairs of woven sagebrush-bark sandals. Years later, radiocarbon dating determined the sandals were around 9,000 years old, and more recent research has places the site as far back as 11,000 years ago.